Hearing aids can be a very, very important part of your ability to get around and interact with the world and the people in it. But if you get the wrong type of hearing aids or if you don’t get them adjusted to your ears, you could lose money and also miss out on important words or noises. Or worse, you could fall victim to dangerous hearing aid scams like so many other people. Unfortunately, there are several bad actors who’ll try to push you into buying in a very personal hearing aid through impersonal methods. Below are three ways you can easily spot a hearing aid scam and tips you can use to avoid them. If someone has reached out to you — and not the other way around — you should be alarmed because they do not know you or care about you. Instead, they're only trying to sell you something. You're nothing more than a dollar sign to them. A hearing aid is not something to be bought and shipped through the mail. All ears are different, so there can be no one-size-fits-all hearing aid. Besides, how can you trust a hearing professional that you can’t even talk to in person? How can they possibly know what’s best for your ears? And are they even a real audiologist? What if you need special hearing aids, like hearing aids for musicians or custom swimming molds? 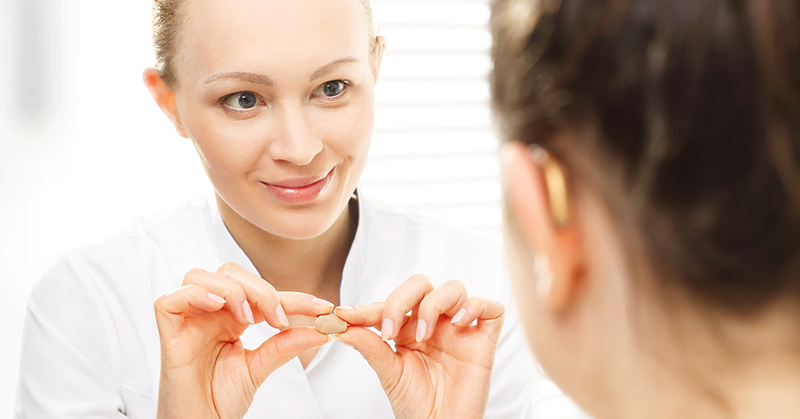 Buying and picking up your hearing aids in person gives your local audiologist a chance to test and make adjustments. This is something a professional should do – it’s a complex process, and not a good fit for a do-it-yourself kit. There are plenty of things that are fine to purchase by mail or the Internet, but hearing aids are not one of them, so avoid these direct sales techniques. It's best to have a complete audiological exam prior to purchasing any type of hearing assistive technologies. Some pushy salespeople out there will give you a handful of minutes to make a decision on a hearing aid. Some will give you three days – though they may charge you more for that “extra” time to make a decision. Three days isn’t close to enough time to make an informed decision. Unless you can spend adequate time in all the places your life takes you in those short windows, you won’t really get a sense of how well they will work for you over time. You’ll definitely want a demo while you’re in the store or the clinic where you will buy your hearing aids – then you’ll need more time. Remember, you don’t have to commit to the hearing aids if they don’t feel right to begin with. You’ll want at least 30 days to try out the hearing aids. That’s enough time to live in them and even forget you’re wearing them. Longer trial periods are even better. Up to 90 days is not uncommon, and you should certainly opt for that length if you can. There’s nothing inherently wrong with saving money, but be smart. You don’t just want the best price. You want the optimal hearing solution for your ears. It’s not worth the savings if the hearing aids you end up with are not right for you. Buy one pair, get one pair free! Free magazine subscription with purchase! Purchase today and get a free VISA or Starbucks gift card! Buy now and pay 90% less than retail! Buy today, pay later when you sign up for our credit card! These are normal for groceries, small gifts, etc., but hearing aids are uncommon items, and shouldn’t be treated the same way. If you see offers like these, you can assume they are hearing aid scams, and you should avoid them. Remember, making the wrong choice just for a giveaway or steep discount can drastically reduce your quality of life for as long as you use those hearing aids. The key to overcoming hearing aid scams is to only do business with a name you can trust, like North Shore Hearing P.C. Even if you've never heard of us, check out our customer testimonials to hear what people like you about their excellent experiences with us. Contact North Shore Hearing today to schedule an appointment.